West Texas Intermediate (WTI) crude oil is a light, sweet crude oil produced in Midland, West Texas, USA. Also known as Texas Light Sweet, WTI is a type of crude oil used as a benchmark in oil pricing and the underlying commodity of the New York Mercantile Exchange’s (NYMEX) oil futures contracts. The price of this contract is widely quoted across analyst reports as the benchmark for global oil prices. WTI crude oil also has a lower level of other impurities, as a result of which it is easier to refine. Moreover, it is easier to transport than heavy sour oil, which has a high wax content, high density and high viscosity. Due to its scarce availability, the demand for WTI crude oil is always likely to remain high. All these factors make WTI crude oil the world’s most liquid oil commodity in an electronic marketplace. Demand Side: Weekly US Oil Inventory Data released each Wednesday is widely watched as a measure of US Demand. USA is the largest consumer of Oil. Supply Side: OPEC meetings can result in changes to group member production Quotas. Weather: Hurricanes can disable offshore drilling rigs which in turn affects supply. Hurricane season in the US begins on June 1st and ends November 30th. Quote convention: USD per barrel, e.g. OIL/USD = 75.00 USD per barrel. Commodities and indices are traded as CFDs with easyMarkets and expire at 12:00 GMT. Please note, OIL expiration time is 15:00 GMT. The expiration of each deal is displayed on your trade ticket, open position and on MT4 Market Watch. easyMarkets® does not rollover expiring deals to the new contract, unless notified beforehand. The client should directly contact easyMarkets one working day before expiry of deal for renewal. Client should note that in the case of renewals, easyMarkets® will not carry the profit or loss to the new deal. Any profit will be credited to your trading account and any loss debited. easyMarkets also reserves the right not to renew the deal if it so chooses. If instructed to, as soon as the old deal is automatically closed, a dealer will open a new deal expiring in the new month that follows the expired deal with the same amount and type of the closed deal. The remaining margin on the expired deal will be placed on the new one, unless the client instructs the dealer otherwise. The opening rate of the new deal will be done at the new month’s rate. 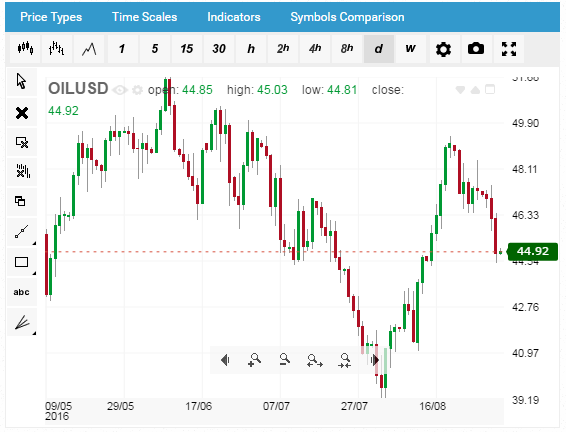 Using an OIL/USD deal as an example: at expiry time 12:00 GMT the old contract closing price was at USD35.50 per barrel and the new contract price is trading at $40.50. At expiry, the old deal will be closed automatically at $35.50. Any profit or loss will be reflected in the margin and thus in the free balance. If instructed, the dealer will open a new deal at a price of $40.50 (the price of the new contract at 12:00 GMT), and place an amount equal to the remaining margin on the old deal, unless instructed otherwise. In order to inquire about expiry date of current contract and difference in prices between the two contracts, please contact your dealer. Trading hours: Trading is conducted 23:00 until 22:00 GMT, Sunday to Friday with a daily break between 22:00 to 23:00. Outside these hours no opening or closing of deals will be allowed. For more information on WTI oil and other related trading products, go to our blog website, forex.info.